Identity Within is the so called “Lost Episode”. Many scripts that are written don’t make it to being produced; sometimes because the stories are rubbish, sometimes because the stories aren’t funny, or sometimes because they just don’t fit into the Red Dwarf “universe”. Identity Within, is none of the above. 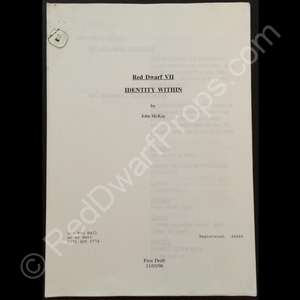 It was written by John McKay, it passed all the tests, and made it as far as story boards being produced. However it was ultimately cancelled due to the high cost of sets and special effects required. The story is hilarious, as it focuses almost entirely around Cat, and how he needs to find a mate else he’ll die. The crew then venture out to find a female Cat. Fans of the show have been in uproar ever since at this episode not being filmed. In an effort to pacify the fans, Chris Barrie complete with story boards, were brought in to narrate the script as a bonus feature on the Series VII DVD. This script, once owned by a member of the fx team, has various highlights made throughout the script. 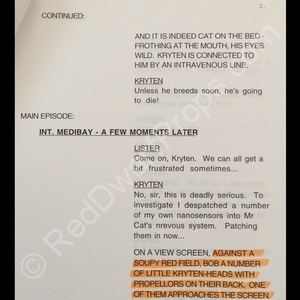 Tagged 1996, Identity Within, Lost Episode, Script, Series VII. Bookmark the permalink.